Ayoze Perez’s header in the narrow clash between two former Liverpool managers looks to have all but sealed his team’s Premier League survival for another season. Newcastle take control of a bouncing ball on the half way line and, with Leicester narrow, spread the ball wide to Matt Ritchie on the left. Miguel Almiron quickly realised the space out wide and moved out from behind Youri Tielemans’ cover into a position to receive the ball. Even when Fabian Schar opts to pass to Ritchie, Almiron continues to drift further wide, turning and making a run towards the touchline ahead of Ritchie. Ritchie passes the ball to Almiron ahead of him and here Leicester are in a good position to defend. Ricardo Pereira stands off Almiron and shows him down the line, making it difficult for the Paraguayan to go down the outside on his preferred left foot. 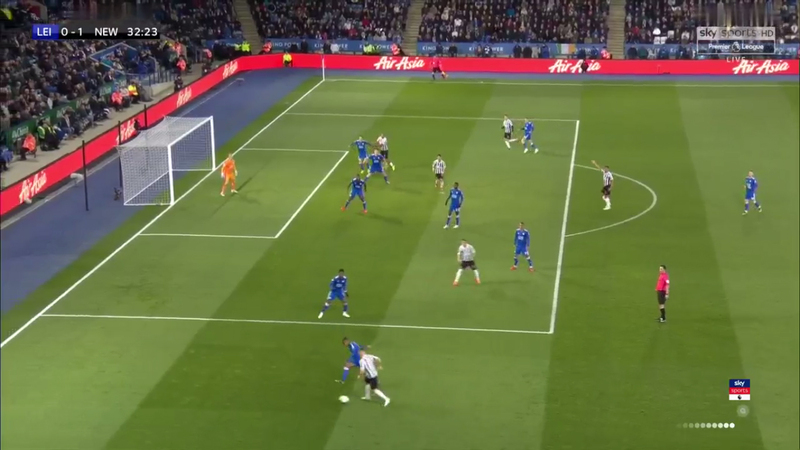 Demarai Gray also got back very quickly to double up, while Leicester’s defenders have a spare man against Salomon Rondon and Perez in the centre. This makes it difficult for Newcastle to get a cross in, and even if they had it’s unlikely it would have been successful. Leicester are in a good position to defend. Pereira shows Almiron down the line, Gray gets back to help and they are three against two in the middle. Almiron fakes to go outside before attempting to cut inside. Pereira’s quick footwork allows him to tackle cleanly with his right leg, but even if he hadn’t, Gray is in a position to defend. The ball then ricochets back out to Ritchie. The wing-back hadn’t done much to support Almiron, hanging back rather than overlapping, but it works in Newcastle’s favour as he is in a position to run onto the loose ball. Shaping to cross first-time, Ritchie sells Pereira a dummy to win himself space to cross – the Portuguese comes rushing out to block a cross, with Ritchie taking short little steps in the run-up as if preparing to send in a ball, only to have Ritchie nip past him with a touch. Pereira overcommits due to Ritchie’s dummy. Perez starts his run with Rondon occupying the other defenders. The attackers also work well in the box. They both hover around the back post – Perez holding off while Rondon moves about bothering the defenders. Rondon had been Wes Morgan’s man in the build-up but he moves towards Harry Maguire once he gets into the box, looking to free up Perez. 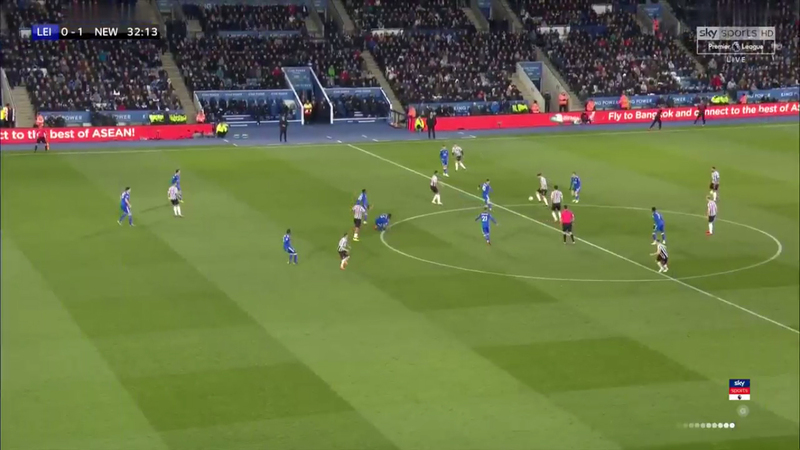 He moves towards the near post when Almiron might cross, only to then shift direction again when he cuts inside, keeping Maguire’s attention with little shoves and eventually drifting away towards Ben Chilwell at the far post, who he is most likely to win a header against if Ritchie were to send the cross towards him. Rondon’s busy work has allowed Perez to lose his marker just by standing still. Morgan is quite flat-footed at the near post and isn’t aware of what’s around him – he takes one long look over his shoulder when Almiron gets the ball, then takes another quick glance just before Ritchie picks up the rebound, but from on he doesn’t check again, meaning as far as he’s aware Perez is still stood around the penalty spot. Perez times his run perfectly, starting pretty much just as Morgan stops checking his shoulder, allowing him to nip ahead of the taller man and finish.